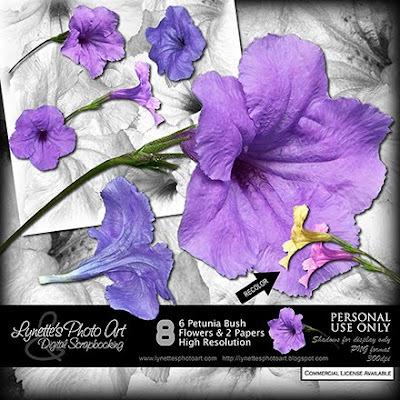 Petunia Bush has 6 rich, delicate, highly detailed blossoms and 2 gorgeous papers $1.99 at my PayPal store. Click image to enlarge. Click Buy It Now button below the image to purchase. Today I'm giving you a piece of this kit to sample. Enjoy! Thank you! Your blog post will be advertised on the DigiFree Digital Scrapbooking Freebie search engine today (look for timestamp: 12 Oct [LA 06:00pm, NY 08:00pm] - 13 Oct [UK 01:00am, OZ 11:00am] ). Thank you so much for this Freebie. I want to let you know that I posted a link to your blog in CBH Digital Scrapbooking Freebies, under the Page 7 post on Oct. 13, 2009. Thanks again. Thank you for the lovely, little yellow petunia.